The Braque Saint-Germain is one of several French braques, or pointers. 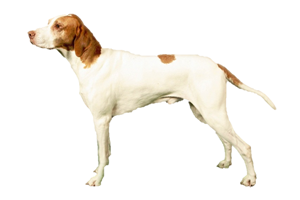 A pointer is a gundog that has been bred specifically for their ability to point. This means that they will freeze when they have found game and point their muzzle towards the waiting animal to give the hunter its location. This breed can also be trained to retrieve their prey once it has been shot. The history of the Braque Saint-Germain begins when King Charles X received a pair of English Pointers as a gift. The male died, but the female was bred with his Braque Français to create the foundation stock. It was developed in the Saint-Germain forest near Paris, hence the name of the breed. Unfortunately, both World Wars almost destroyed them and its numbers have never recovered, making it rare even today. Is the Braque Saint-Germain Right for You?